Anderson Cooper was back in the NYC studio and anchored AC360 in the 8pm and 9pmET hours. Anderson Cooper anchored AC360 in the 8pm and 9pmET hours from CNN's Washington DC Bureau. As if CNN broadcaster and newsman Anderson Cooper didn't already lay claim to an immense amount of fame, today's eyebrow-raising political climate has practically magnetized the celebrity profile of every cable news host out there--including that of the silver fox. 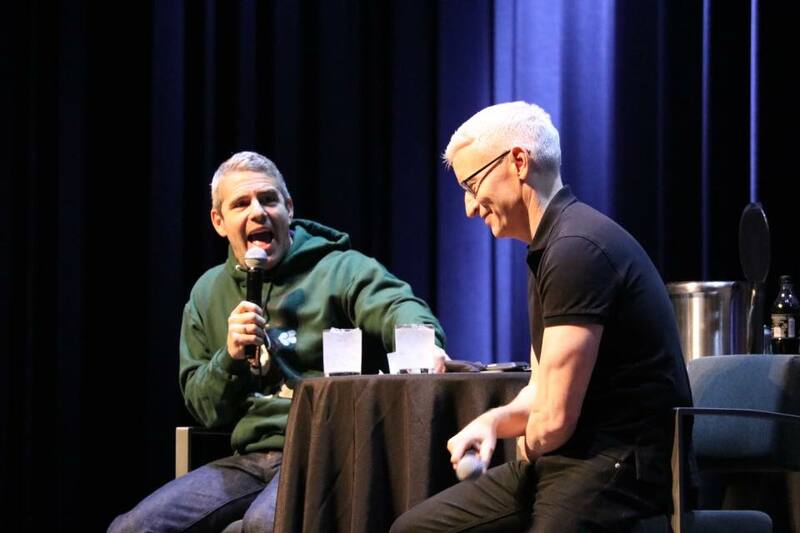 That makes it especially notable when he swings through the area, in this case, for his May 5 show with Andy Cohen at the Borgata Hotel Casino & Spa's event center. During the show, the two friends essentially shoot the breeze for two hours, sharing stories, interviewing each other and, surely most interesting, taking questions from the audience. 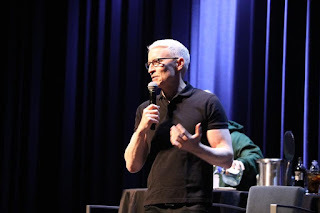 Here, in anticipation of his appearance, we catch up with Cooper to talk about the upcoming stage show, but also Kathy Griffin, what TV he's glued to when he's not on it and what he considers his weird--or, at least, odd--hobby. You have a show coming up with Andy in Atlantic City. But you’ve been doing this tour for a while actually, right? We’ve done – I don’t know how many shows, but about three years on and off. It’s not like a full-on tour. It sounds a little grandiose to call it a tour. Maybe one week a month, 10 months of the year, we go somewhere in various locations and theaters and it’s been fun. Three years ago, I never thought it’d go on this long. We’ve done probably 30 or 35 shows now, and the audience seems to have a good time and we have a great time doing it. Has the dynamic changed at all? Andy and I have really great chemistry together. We couldn’t be more different, in many ways; he’s very extroverted, I’m very introverted, and I think it’s interesting to see that dynamic play out. 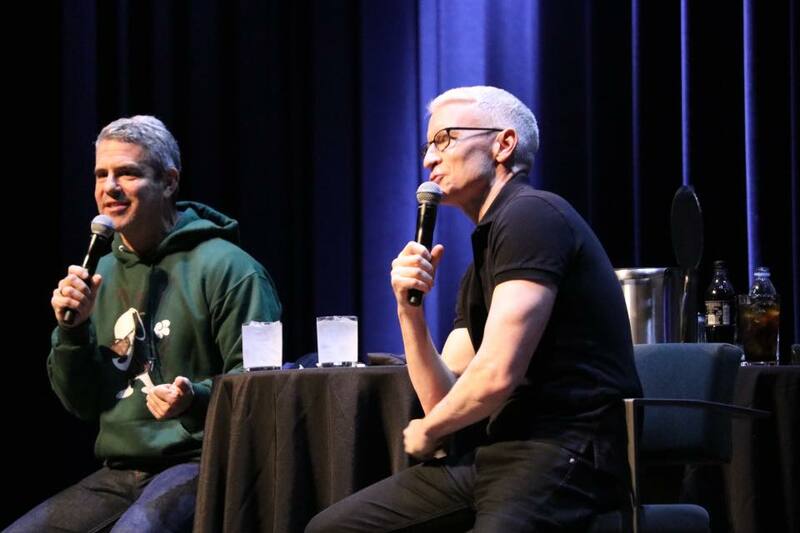 Andy always says that the way I am on stage doing our show is the best version of me--the most extroverted I ever am, the most animated, and it’s the side of me he likes the most – that my friends like the most. It’s surprising for a lot of people who come; they expect Andy to be the extroverted guy, but I—I think it’s sort of surprising for people. What’s the most surprising thing you’ve been asked by the audience? We’ve gotten pretty much every question you can imagine, appropriate and inappropriate. A lot of people ask Andy “Housewives” stuff; there’s a lot of “Housewives” fans who come. Various questions about that. But this is not a night of politics...we rarely get political questions, which I’m more than happy not to get. It’s nice to have a night where everyone puts politics aside, and we want it to be a fun night for everybody. You’ve dabbled in your career quite a bit: CNN, “60 Minutes,” your brief talk show, the HBO documentary; this is a live stage show, though. What’s the biggest difference between doing a live stage show versus live TV? It’s completely different. Being in front of an audience, usually, it’s about 2,500- to 3,000-seat theaters we book, and having the energy—you hear performers talk about sort of getting the immediate response from an audience, and it is extraordinary to feel that – to tell a story and have people laughing and reacting in real time. In TV, you’re talking to a piece of glass, the lens of the camera, with no sense of people seeing it. It’s rare you get a sense of the response to what you’re doing. But to get the immediate response is super cool. It’s certainly not work. The only reason Andy and I continue to do this is it’s amazingly fun, in front of the live audience. A lot gets made of the ratings between MSNBC and CNN and FOX--especially lately, with MSNBC in the news [for taking the ratings lead], but are you guys that serious about it like the politicos are? Or are y’all sharing a beer with Rachel Maddow after work and laughing about the whole thing? I wouldn’t say laughing—I don’t really get to see other people with my schedule; I don’t even get to see my friends, so it’s not like we all hang out together in a green room somewhere after our shows. But I think television writers pay attention to ratings and stuff like that. I think my focus is to do the best broadcast I can every night, and things are happening so fast now and changing so fast, if you’re focused on ratings and producing a show based on what the Nielsen number was the night before, that’s just a huge mistake because you’ll just end up chasing something not really worth your time. People often remark how calm you seem despite all the chaos. What do you attribute that to? Do you think of yourself as calm? I am. I am pretty calm. The more chaotic things get around me--I’m used to chaos around me. When I first started, I worked overseas a lot in some very dangerous places, and I find myself able to operate in those kinds of environments. So, I don’t know—it seems the more chaotic things get around me, the calmer I get. And I like being an island of calm in the midst of a swirl of chaos. The show, do you think it’d work if you did it with someone else? Kathy Griffin? Do you keep in touch with Kathy? Um, you know, I have not talked to Kathy, I don’t think. I wish her the best and I’m really happy she’s going back on tour and booking theaters, and I wish nothing but great things for her. I know you live in New York, but what city would you live in if not New York? Been to Philly? We did a show in Philly and my half-brother lived in Philly. I really like Philadelphia. It’s a cool city. I was there for the conventions, local conventions, weekends and stuff...I love Rome. I have a house in a small town in Brazil I really like. Not sure I’d live there full-time. But I like to travel a lot. It seems the more chaotic things get around me the calmer I get. And I like being an island of calm in the midst of a swirl of chaos." That’s a good question. I’m actually reading I Claudius, which is a book by Robert Graves. When I was a kid...Masterpiece Theater did a TV series about it and I loved the TV series. Most celebs don’t like to talk about celebrity crushes, but what about a fictional character crush? One of my earliest crushes was a fictional character on Robby Benson, an actor who was in a basketball movie when I was a kid called, “One on One.” You can Google him. I was so young I had no idea what it was—I realize now, of course, I just, I don’t know. One of those early gay moments when you’re a kid and you don’t know why you’re so attracted to this person or so interested in them, but that was probably my first celebrity crush. What music are you running to? I’m bad with music. I didn’t grow up listening to music. So, I’ve only been to a couple concerts, like Madonna, a Roger Waters concert, a Pink Floyd concert which was incredible, U2, Elvis Costello as a kid. What am I listening to? I just watched this documentary about Nina Simone, on Netflix—it’s really, really good. Even if you don’t know anything about Nina Simone, which I didn’t, she’s just incredible. I’ve been listening to al lot of her music and remixes of her music. So now, I’m at the gym listening to a bunch of remixes. If someone walked in your house right now, which room would they find as the messiest? Hmm, I’m pretty neat actually. I guess—yeah, I don’t know. I’m really neat. I live in an old firehouse, a 110-year-old firehouse. It’s kind of—I like big industrial spaces, so it’s a four-story converted firehouse. What’s a delicious meal you’ve had recently? OK, so I so don’t care about food. I eat the same thing every day, pretty much. I have the palate of a 5-year-old. I often order off the children’s menu at hotels. I love PB&Js. There are two restaurants in New York – one is Italian, and another a farm-to-table restaurant called Blue Hill, but that’s as adventurous as I get. Is this because you don’t like foods or you don’t try them? I just don’t try them. Anthony Bourdain, sometimes we’ll record a segment together and he’ll insist we do it over a meal and it’s usually a meal in an exotic restaurant. He’ll force me to eat a pig aorta or strange foods. That’s as extreme as I’ll ever get. I literally eat the same thing every day. Any hobbies others might find weird? Hobbies…I’m really into art and just started doing that in the past two years, but don’t think that’s weird. I started collecting barber shop signs in Africa, which might sound odd. I spend a lot of time in Africa as a teenager and starting in my career, and–in fact, anywhere in the world I go I look for hand-painted signs. I guess that’s a hobby. Barber shop signs, restaurant signs, but ones that are hand-painted. Not like electronic signs. An artist has drawn them, like a work of art. And you put them in your big firehouse? Does it ever feel too big? To my friends it does—I don’t know, I like it. I like having space. I like old things, I like the history, I like having the old books and just old stuff. You’re doing a show with the person behind “Real Housewives.” What’s your binge-y junk TV? There seem to be a lot of international shows lately, yes? I’m running out. There’s tons of it. I have Starz on demand, I just realized, and there’s a great show called “The Missing,” a two-season show, a British-French production. It’s really good. I like discovering some drama I’ve heard nothing about and can fall into. Isn't it ironic that you escape drama with dramas? I oddly find it relaxing. It takes me out of the day-to-day world I work in, in politics, and it takes me to another place. I like that. Whether traveling around the world or ordering at a restaurant, Cooper reverts to comfort and memory. “I have the palette of a five-year-old. I order off the kids menu at hotels,” he jokes in an interview with Travel + Leisure. Cooper had just finished dining with Anthony Bourdain at Heidelberg, a German restaurant on New York City’s Upper East Side. The menu was not for kids. Cooper holds Africa particularly dear. At 17, he left high school and rode in a truck across sub-saharan Africa (the lead-up to which he self-effacingly refers to as “a long, boring story,” by the way). In the years since, he has returned numerous times to the continent. He cites seeing mountain gorillas in Rwanda and diving with great white sharks off the coast of Cape Town as two of his most memorable travel experiences. He returns often to his seaside house in Trancoso, Brazil (he wrote about it for Travel + Leisure in 2015) — a place he is trying to convince Bourdain to visit. “My town is this really unique little place so I’m always trying to get him to go there,” Cooper said. Asked where he plans on traveling next, Cooper mentions Luang Prabang, Easter Island or the Galapagos — although it’s impossible for him to say for certain where he’ll end up next. Anderson Cooper’s interviews with Anthony Bourdain will air on Anderson Cooper 360 every Friday night, beginning April 27. Anderson with Mark Bradford posted to his Instagram page last month. "Collectors are very interested in what artists of color have to say now," said Jack Shainman, whose gallery represents Hendricks. "For many years it didn't matter." Among those drawn to these narratives is CNN's Cooper, whose eclectic collection of mostly figurative art ranges from Old Master canvases to hand-painted, wooden barber signs from East Africa. In recent years Cooper added works by several black artists to his collection, although he said he doesn't view black art as a collecting category. He owns an abstract painting by Bradford, which incorporates pieces of paper from his mother's hair salon and Nathaniel Mary Quinn's collage portraits of the residents of Chicago housing projects where he grew up. "The work seems a genuine reflection of their past , present and view on society," Cooper said of the artists he admires. Anderson Cooper anchored AC360 in the 8pm and 9pmET hours from the NYC studio. Most of the program was spent remembering former First Lady Barbara Bush who died earlier today. Anderson Cooper anchored AC360 in the 8pm and 9pmET hours from the NYC studio. Most of the first hour was reporting and discussion of Trump and his lawyer Michael Cohen, then Trump ordered an attack on Syria and the conversation changed for the remainder of the program. 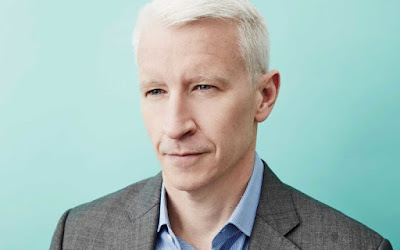 Anderson Cooper anchored AC360 in the 8pm and 9pmET hours from the NYC studio. Much of the first hour was Anderson's interview with Roger Stone. If anyone's interested, please leave a request in comments. We do have the video.